I thought it was about time to start including drinks in my blog as well. I occasionally make my own drinks, ranging from variations of hot chocolate over ice tea to pink lemonade and all kinds of smoothies and mocktails. Especially during summer nothing beats the fresh taste of a cool homemade drink. 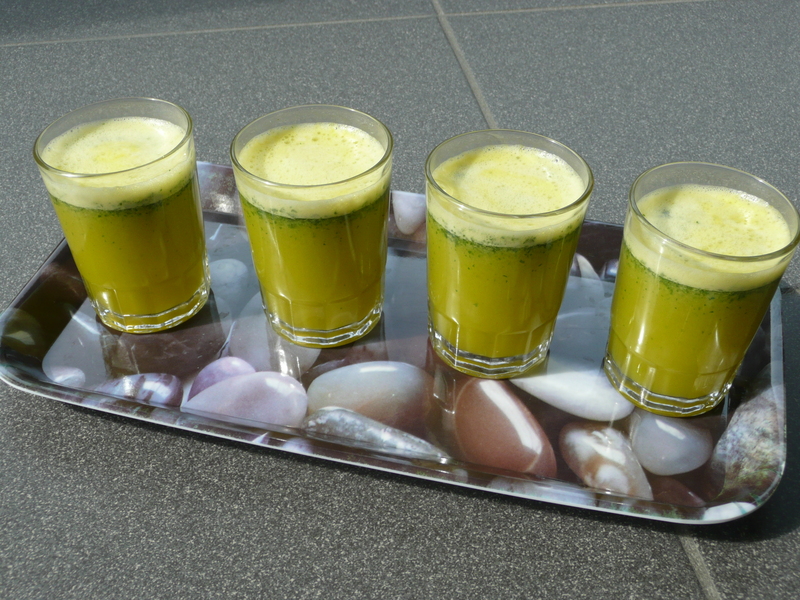 This time, I drank a delicious juice over lunch at one of my favourite hangouts in Mechelen: Beans. They call this drink the Mint Mix. It seemed the perfect accompaniment for my bagel (it was) and I immediately wanted more… so I tried it myself! Here’s how: add a small handful of mint leaves, a squeeze of honey, the juice of 3-4 limes and 1/2 l freshly squeezed orange juice (you can cheat with shop bought, but as it’s sweeter, you may need more lime juice) to the blender, mix and pour (or store in the fridge until ready to drink). Enjoy while listening to Summer Nights from the Grease movie: summer feeling guaranteed! When it’s really hot, no cake or cookie will do, that’s just way to dry and sticky. 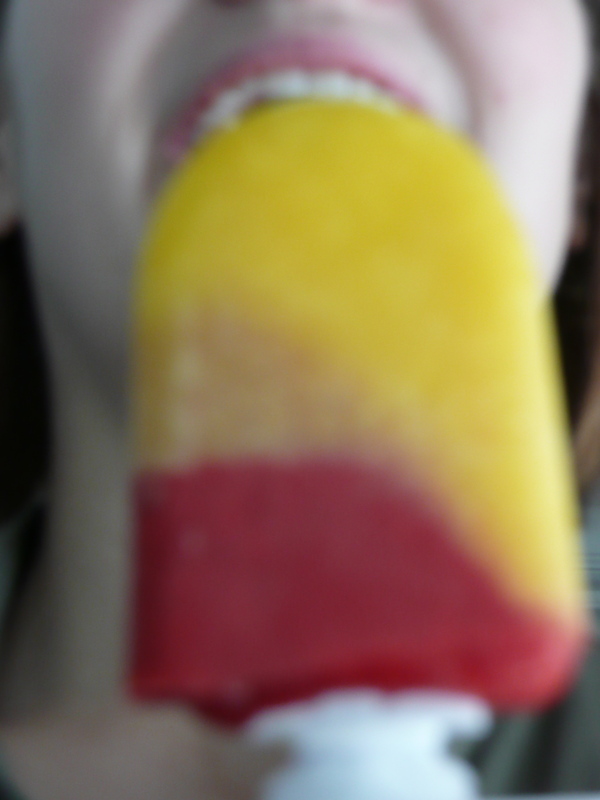 You need something cool and fresh and an ice lolly does just the trick! On one our recent trips to London, I was browsing the cookbook section at Waterstone’s (as usual) when I heard a little girl say to her sister: “This looks really yummie!”. I immediately took a look and she was talking about Ice lollies and other fruity frozen treats, a neat little book that indeed looked very very yummie. I couldn’t resist and with the sun coming out, it was time to put my new little book to the test! To make 6 ice lollies, you need 300 ml freshly squeezed orange juice for the oj part (and no shortcuts here, juice from a bottle or carton just won’t do). For the raspberry part, puree 350 g fresh or frozen raspberries in a bowl with a fork or in a blender. Strain through a sieve and stir in 2 tbsp runny honey. Half-fill each mould with orange juice and put in the freezer for 30 min before adding the raspberry mixture and freezing for another 4-6 hours. When ready to serve, dip the moulds in hot water for a few seconds to loosen the ice lollies. If you can’t wait that long, you can invest in a zoku: this is a block that you keep in the freezer, and when you want ice lollies, you take it out, fill it, and wait 10-15 min and your lollies are ready! You can make up to 6 in one go (two batches of 3) so it’s great if it’s only for a few people and if you never manage to plan ahead when you will want ice lollies (much like me). If you love ice lollies so much that you always have a couple in stand-by, then this is not the tool for you, just buy the regular moulds instead. Or keep small containers, like yoghurt pots, and buy some sticks. They will do just as well as ice lolly moulds! Start licking!